Transcript Copyright 2006, The Estate of Alex Toth all rights reserved. David Armstrong: 50-60 years, yea, exactly - since the beginning of the medium. He’s done some spectacular work in various media and all kinds of genres. There will be an art show at the Omni Hotel tomorrow from 10 o’clock to 3 o’clock. It’s open to the public. It shows the breadth of his work and it’s pretty spectacular. 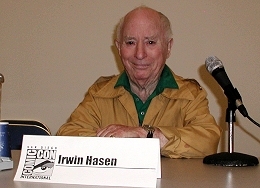 Irwin Hasen was actually considered by Alex to be a mentor and worked for DC Comics in the late, started in the late 30s and early 40s on Green Lantern and WildCat. And worked with Alex on some of his earliest work for DC and spent quite a bit of time together. And then Irwin went on to do Dondi the comic strip for the daily paper. David Armstrong: He was really good, he loved every minute of it. And continued on for 20?.. David Armstrong: And is an elder statesman and will let you know that in no uncertain terms. 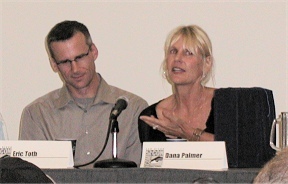 Dana Palmer is Alex’s oldest daughter. She is an accomplished photographer and her website – you can actually find out by going to her website and taking a look. Dana.com? David Armstrong: danapalmer.com. I’ve been to the website and she’s very, very good. She’s so good she gets to turn down work. That’s how good she is. And that, in the professional world, is pretty good. Dana Palmer: That’s my father’s genetics. David Armstrong: Next to her is Eric Toth. And Eric is an accomplished designer in the automotive business. He lives in Michigan and has designed internationally for various companies around the world. Next to him is Mike Royer. And Mike… did you start in the business with Russ Manning? David Armstrong: He was one of the first of the kind of new wave of artists to settle in Southern California. He worked for Russ Manning and later for Jack Kirby. And became a very well known Disney artist. And is best known for Pooh. That’s Winnie the Pooh. [laughter] He uses that in conversation to grab a little attention from time to time. Next to Mike is Paul Power. Paul met Alex in Australia. You’ll notice by his accent, he talks funny and that’s ‘cause he’s from Australia. Alex went to Australia to work with a crew there to work with a Hanna Barbera product. And they met and he became Alex’s protégé and has done several in-depth interviews with him and talked to him. Next to him is Rubén Procopio who is a sculptor, animator, and a board artist. Currently, most of what he does is sculpting both for sculpting that is sold as product and also as maquettes for 3-D models for animation. And his work is very spectacular. David Armstrong: 25 years. And that started in a convention that he went to in North Carolina which is where John is from. Next to him is Tom de Rosier. Tom de Rosier is an animator currently at Disney. He’s worked on….he’s a board artist. And by the way, for those of you who don’t know, board artists are the guys who actually set the action and the pace for animated shows – both features and series. And he’s worked on some of the – the Lion King – and some of the top hits for Disney. 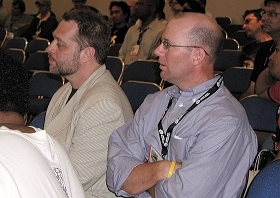 [He’s] a very accomplished animator and is quite an expert on Alex’s career in animation. 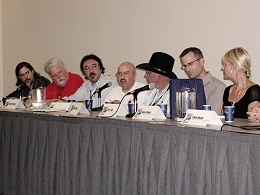 Obviously, everyone on this panel knew Alex very well, at various times in his career. I would like to start with Irwin because Irwin, probably, chronologically fits first. He tells stories of how he and Alex used to work together. But, let me have him tell you how they met and how they got together, how they worked. Irwin Hasen: 10 years….and he liked my work. I couldn’t figure out why he kind of latched on to me and we became friends. And we’d share his mother’s wonderful Hungarian goulash. [He’d] bring it over in a can, or whatever, a package to my little studio, my one room studio in Manhattan. And we went around my neighborhood. And I can’t really figure out how we became dear friends. It was a brief moment in my lifetime and in his but sometimes you have a brief moment when you’re very young that stays with you for the rest of your life. It has to do apparently with parents; of course, sometimes it’s forgettable with parents. But, Alex for some reason or another latched on to me. And I don’t remember the mechanics of how I felt about his work because I was struggling with my own. And I was always a pedestrian kind of cartoonist among a stable of damn good [cartoonists] – Joe Kubert, Carmine Infantino – a lot of top guys in our business. And I always felt, you know, that I was a nice kid, made people laugh and they let me work for them. David Armstrong: I did want to say one quick thing. I heard a story that Alex and Irwin would go to Irwin’s apartment to start an assignment and they’d start and Irwin would go out for quite sometime… and Alex would finish the job by the time he got back. Is that true? Irwin Hasen: You mean finish my job? David Armstrong: No, his job. Irwin Hasen: Oh, his job? David Armstrong: He has good work ethic. Irwin Hasen: I don’t think I had that much room in my apartment. I don’t know where the hell he was sitting when he did that. And I went out? Did I go out cavorting? Irwin Hasen: Did I have a good time? I mean was I having fun? Did he tell you this? ‘Cause, Alex was a very shy young kid. He sat at the drawing board and, I guess, he was sitting in my studio and I would say “ta, ta” and I had to go somewhere. He probably sat there and I knew he would be there when I returned. And we would talk for the rest of the evening. David Armstrong: Alex was always very approachable. Mike Royer moved to California in 1965 and wanted to get in touch with Alex. How did you get in touch with him? 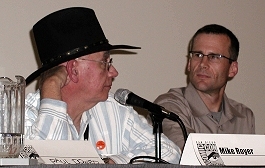 Mike Royer: I had read somewhere, and it was obvious if you look at his work, that he was influenced by Noel Sickles – who did the Scorchy Smith comic strip for a while in the 1930’s. I looked in the telephone book and found that he was listed. And I thought, golly, I’m going to give him a call. So I called him and said, “Alex Toth, I have a stack of old Scorchy Smiths cut from the newspaper, would you like to have them?” And he said, “Come on out!”. He gave me the directions, I drove out to his house and to the chagrin to his wife I stayed for eight hours. I had dinner and we stopped and we watched an episode of Johnny Quest. And that’s why I became a fan of not only Alex Toth the artist, but Alex Toth the man. This man welcomed me into his home, a perfect stranger, but because we had a similar interest in Noel Sickles, and television, and comics in general, it was like being a member of the family. And I don’t know how you can break down the scale of things in life but I gave it a ten plus, boy. And Dave just reminded me because sometimes I suffer from information overload and can’t find the password to access the hard drive [points to head]. But Dave said that I introduced him to Alex. 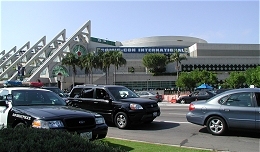 Mike Royer: Was that at the 1970 convention? At the Disneyland Hotel? Mike Royer: Yes, I think it’s the old movies connection. David Armstrong: And finally, that’s the way I met Alex. I would collect movies and ended up going out on his recommendation and. …..We’re going to have to tell this story. And I’m just going to begin it and someone else is going to tell it. The reason I met him was because I had a couple of Errol Flynn movies and this was in the old days before VHS cassettes. We had a 16mm print and Alex had bought, from Warner Brothers, a print of “The Adventures of Don Juan”. Now, either Eric or Dana should probably talk about this because it was something that stayed with Alex for the rest of his life. He always talked about it. Do either one of you want to talk about it? Dana Palmer: Well, yea, he did, he loved that. And I remember because he had the projector in the living room and the big reels and it broke, the film broke every five minutes and there was a four-letter word he would scream and the kids would run out of the living room. But he would sit there, and it wasn’t really patience, but he would splice it back together, start it again, and then you ‘d hear [makes clapping sound like broken film] and…. I’m not going to say the word. I would say it to Dave but I won’t say it to you but, he did, he loved that. In fact, he had those reels, he still had those reels. David Armstrong: And by the way – he bought them from Jack Warner’s son, as it turns out. Which is a pretty interesting story. But, he was, Alex was a man who had lots and lots of different things that he loved. Movies [were] one of them. I found out later in life that he loved steam. And there are lots of kind of things like that – that show up. John probably had a lot of those types of conversations in the letters that went back and forth. Were there any specific things that surprised you about Alex? John Hitchcock: Well, I think the appropriate thing to say is in 1987 Alex came with me to San Diego and we drove down in his car. And the first thing you people are going to say is, “How the hell did you get him to come with you to San Diego?”. And I had kidney failure and was on my deathbed in the hospital and he called me 6, 7 days a week and wanted to know if I was O.K. So I knew I had him right there, you know what I mean? So, I told him, “If I get better, you got to go to San Diego with me.” Well, I got better and he went. And my buddy dropped me off at the house and only Alex would say this. He stood up and said, “I don’t know Hoss. I feel like a bag of broken glass.” Now, I knew that I was going to be in for a tough time but it was a gas. We got in his car, we took off, he pointed out the city of San José [pronounced by John as San Josie] and I’m from North Carolina, what the hell, I could fall for that. And a weird thing happened. Someone decided to change lanes without signaling and Alex suddenly said, “They just broke the law!” and he hit the accelerator and was going 90 miles an hour chasing this car down the street, down the highway [in] L.A. And I’m like scared to death. And I started thinking and I said, “Uh, I’m not from around here. Didn’t I hear of some gang shootings on the L.A. freeway recently?”. And suddenly the car went from 80, 90 to like 60 and he said, “Good point.”. So, we went to the show. Part of the day on Friday, and then on Saturday. There was this huge crowd, as you can imagine – and we up went to get tickets to get in and they tried to charge $20. I was trying to pull $20 dollars out of my wallet as fast as I can because I knew that’s what he was searching for. And he suddenly said, “20 dollars? You’re on your own Hoss!” and he ran away. And I had to chase him down, I found him at the bus stop. And he said, “Look, I’m going to go have lunch. I want you to find two people – Archie Goodwin, Doug Wildey.”. Now Archie was a good friend of mine. I didn’t know what Doug Wildey looked like. But he said, “Just find them.”. So I walked around and found this tall guy with a cowboy hat and I said, “Are you Doug Wildey?”. And he said, “Yea.” And he ran to go have lunch with Alex. 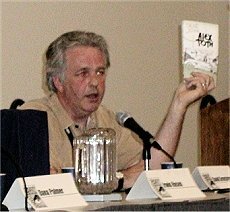 But, that breakfast, I got a little ahead of myself - at one time, at one table, because it was Alex Toth, was Julie Schwartz, Jack Kirby, having a cup of coffee, Alex and Art Spiegelman. At one table and I was sitting there going, “Who made me king, to be around this kind of brilliant people?”. And later at the swimming pool it was Archie, Doug Wildey, Alex and Will Eisner. And there were people walking by the swimming pool almost falling in, looking at all these people [thinking], “what the hell’s going on with all these really cool people sitting in one place?”. It was pretty intimidating. And I looked at Archie and said, “I don’t know if I can handle this. This is a little too high cotton for me.”. And Archie said, “I know how you feel.” But that was how wonderful Archie was. Archie loved Alex and loved his work. And they were really good friends. John Hitchcock: But I wanted to tell that story because we are at San Diego and it seemed very appropriate. He did try to push someone in the swimming pool. 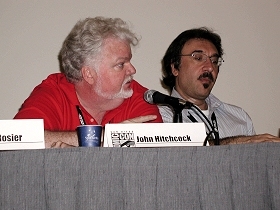 He threatened to..
John Hitchcock: I was told not to mention names…. John Hitchcock: Well, yes, but Bob asked for it. John Hitchcock: He always sent them something…. Dana Palmer: John, I just wanted to let you know that Daddy is here [pats cloth covered box of ashes]. Because, it was sort of a joke. We were trying to convince him to come this year. And, I’ve never done anything work related with my father but we were hoping that he could make it down. And, I’m convinced, now that I’ve come for my first year, [that] he would have never gotten out of the car. I am my father’s daughter and this is crazy. There are so many people [here]. But we take him with us to special things like this. So, he is here today in spirit.